Ann and Jeff VanderMeer’s latest publishing venture, Cheeky Frawg e-books, is very exciting. Between now and the end of 2011, this imprint will publish or reprint an eclectic array of titles, by an equally diverse selection of authors. You can read an e-version of Amal El-Mohtar’s wonderful collection, The Honey Month; a sampler of Women of the Supernatural, edited by Ray Russell (Tartarus Press); a collection of ODD? 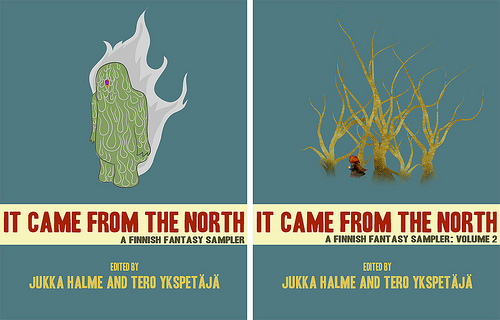 new stories edited by Ann & Jeff; a massive three-volume set of Finnish weird fiction (rough covers pictured above — I’m so looking forward to this one! ); Jagganath, the first collection of awesome Swedish writer, Karin Tidbeck; The Encyclopedia of Victoriana by Jess Nevins — and on, and on, and on! Be still my heart. E-reader manufacturers around the world might as well all officially thank the VanderMeers for single-handedly increasing their sales over the next six months. Seriously. Read all about the gamut of forthcoming books here. Tags: amal el-mohtar, ann and jeff vandermeer, cheeky frawg, e-books, encyclopedia of victoriana, finnish weird, it came from the north, jagganath, jess nevins, karin tidbeck, odd?, ray russell, tartarus press, the honey month, women of the supernatural. Bookmark the permalink.